Following the Mood Messages of a Skype employee in my Skype Conversations window I came across this last Friday: “brand new version of Skype To Go available. Dead simple to use, nothing to download, call directly from your contact list !” Curious, I went to my Skype To Go subscription where I found all six of my Skype To Go contacts had suddenly, and spontaneously, sprouted individual 647 numbers (647 being the overlay area code for Toronto’s legacy 416 area code). Previously I had a single Toronto-based Skype To Go number which I would call to access one of my six contacts by selecting a number between “1” and “6” when I called the number. This process, using a Bluetooth connection between my BlackBerry and car audio system, meant my “hands free” calling to this number in my car required that I actually use the keypad on my car’s “phone” panel. The new Skype To Go resolves this issue and more. When calling from a registered phone to one of the nine contacts, there is no need to wait for any voice prompts; the connection is now immediately made. Validated with a PIN and entering one of the registered phones’ numbers, one can call these numbers from any other phone. You register also the Country and Area Code you are calling from. When you move to another Country you can change the registered Country and get new local phones numbers for each of your Skype To Go contacts. But when you return to your “home” country you will get back your original Skype To Go numbers. The listing also shows what your charges are to these numbers below the destination number. You can select which of the registered numbers you want to display as your callerID when making these calls. What’s not changed? Your old Skype To Go number which you can still use for calling numbers not included in your Skype To Go contact list. 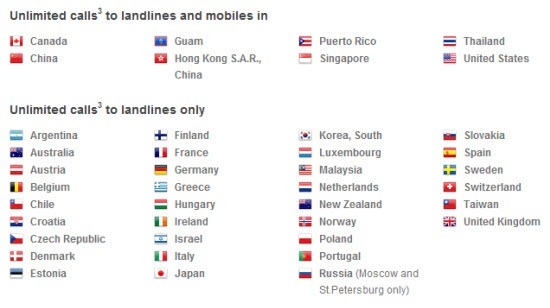 If the number called is on one of your Skype subscription plans, there is no charge to landlines and mobiles in the eight countries with totally unlimited calling; for the 33 countries with unlimited calling to landlines only you pay the going Skype calling rate for calls to mobile phones (for instance, $0.317 per minute to mobile numbers in Spain). Note that Skype’s fair usage policy applies. If not on a subscription you pay, via Skype credits, the normal SkypeOut charges plus a connection fee. 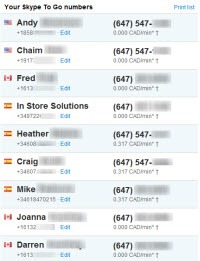 Bottom line: I can now make totally hands free calls to these nine “most frequent” contacts using Skype To Go from my car via my BlackBerry or iPhone simply by pressing the “Enter” button on my steering wheel and saying “Call [Name] Other”. To simplify this process I have recorded these Skype To Go numbers under “Other” in my smartphone and Outlook address books. Back to total compliance with Ontario law regarding use of mobile phones while driving. Are Canadian online numbers still available? I checked my skype account today (27th Dec) and Canada does not appear to be listed. Skype has never offered Canadian Skype Online numbers due to regulatory issues; they still only offer Skype To Go numbers as outlined in this post.